Ankur Arora Murder Case makes an attempt to tell a new tale, writes Joginder Tuteja. Cases of medical negligence make fairly common news. While we tolerate the even more common news of scams and corruption, cases of medical negligence are harder to accept because a person can lose his or her life as a result of wrong diagnosis, prescription or sheer apathy. 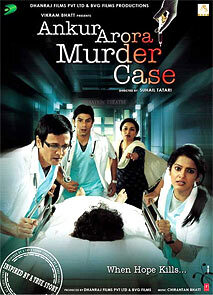 In Ankur Arora Murder Case, over-confidence of the doctor is the culprit. This is not a Satyameva Jayate type of offering and director Suhail Tatari isn't tugging your heart strings a la Aamir Khan. The intention is to highlight a different theme while ensuring that the narrative doesn't get into the art house zone. From that perspective, Tatari has come some way from Summer 200, the issue based film he made five years ago. Incidentally, one of the key protagonists in that film, Ashtuosh Rana, was also a doctor but shown in a more positive light. In Ankur Arora Murder Case, the filmmaker brings his antagonist (Kay Kay Menon), carrying a trait similar to Shah Rukh Khan's ‘I Am The Best' act (Phir Bhi Dil Hai Hindustani) into 'junta ki adaalat'. The only difference being that while Khan was repentant and made amends, Menon does not. This is the reason a horde of characters are brought together to ensure that Ankur Arora (Vishesh Tiwari), the child who dies because of Dr Asthana's (Menon) negligence gets justice. His strong mother (Tisca Chopra), a young doctor with a strong resolve (Arjun Mathur), his reluctant girlfriend (Vishakha Singh) and a determined lawyer (Paoli Dam) join hands to ensure that Dr Asthana is brought to book. The narrative unfolds at a good pace, though the film is a little too long. The two love stories that are woven into the film may have brought Ankur Arora Murder Case a little closer to the commercial Bollywood formula, but they could have been done away with. The big plus point of the film is the acting. The performances are consistent and competent. Kay Kay Menon just cannot act badly. Tisca Chopra is good without the histrionics of Taare Zameen Par. Paoli Dam gives a fine account of herself in a role that is the antithesis of the one she played in Hate Story. Arjun is earnest, as he has been in other films where he has been part of an ensemble cast. Vishakha is adequate while Manish Chaudhari and Harsh Chhaya are as usual, which is also their strength. Vishash, last seen in Ek Thi Daayan, is good. Protégés taking on mentors is a theme much explored in Hollywood. Wall Street is a shining example, set against the background of the stock market world. Ankur Arora Murder Case may not do the same for the medical profession, but it at least makes an attempt to tell a new tale.